Gregory Porter soon returns to the UK to perform at the prestigious Royal Albert Hall. With additional dates added due to popular demand, Gregory will now appear on Monday 2 April, Wed 18 April and Thursday 19 April. Gregory became the biggest selling jazz artist in the UK in 2017, following the success of ‘Nat King Cole & Me’ which landed No.3 on the Official UK Album Chart on release. It was his highest ever chart position and biggest-selling first week. ‘Nat King Cole & Me’ was also Gregory’s fastest streamed album to date, hitting one million streams three times faster than his previous album, ‘Take Me To The Alley’. ‘Nat King Cole & Me’ is the follow-up to Gregory’s Grammy-winning albums ‘Liquid Spirit’ (2013) and ‘Take Me to the Alley’ (2016). ‘Liquid Spirit’ took Gregory from being the biggest name on the jazz scene to being one of the most sought-after singers around today, performing sell-out shows across the UK and being invited to perform on high profile TV programmes including The Graham Norton Show where he recently performed with movie legend Jeff Goldblum, as well as Strictly Come Dancing, Saturday Kitchen, The Andrew Marr Show and the BBC Music Awards. 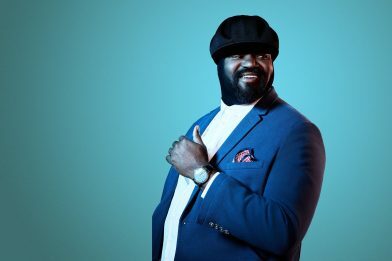 Gregory even launched his own TV series last year, BBC Four’s Gregory Porter’s Popular Voices, a three part series, which explored great vocalists throughout history. He has become an adopted national treasure in the UK, visiting number 10 Downing Street, and singing for the Queenmultiple times, as well as major music festivals including Glastonbury, where he performed on the Pyramid Stage alongside the likes of Muse, Adele and Coldplay. Gregory’s ability to transcend genres even extends to his surprise dance hit ‘Liquid Spirit Claptone Remix’ which became one of the most popular tracks in Ibiza. Nat “King” Cole & Me is out now: Standard album: https://lnk.to/GPNKCinSFP Deluxe: https://lnk.to/GPNKCindlxFP Vinyl: https://lnk.to/GPNKCinVFP Explore more music from Gregory Porter: https://lnk.to/GregoryPorterPlaylist Follow Gregory: Spotify – http://po.st/gregoryporterspotify Facebook – https://www.facebook.com/gregoryportermusic Twitter – https://twitter.com/GregoryPorter Instagram – https://www.instagram.com/gregoryportermusic/ For Gregory Porter, the influence of Nat King Cole on his life and music runs deep, a through-line that reaches back into some of his earliest childhood memories, and culminates in the release of the two-time GRAMMY-winning vocalist’s stunning fifth studio album Nat King Cole & Me, a heartfelt tribute to the legendary singer, pianist, and Capitol recording artist.